It’s hard to believe how the Advent season is nearly upon us. We’ve got almost two weeks, though, so we can still solve your problems by getting the right resources for your needs in plenty of time. We describe some shipping options at the order form page, but US mail is working just fine. Just follow the link, below to place orders, easily. All books listed are 20% off, too. We’re glad to be able to offer such interesting titles. Many of the good books we’ve listed the last few years here or here or, for children’s books, here, are still in stock or readily available. 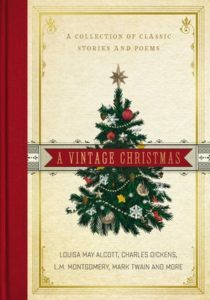 Check out those lists if you’re a book-lover who loves the Advent season. We think they are helpful and good to know about. If you agree, we’d appreciate your willingness to do business with us. 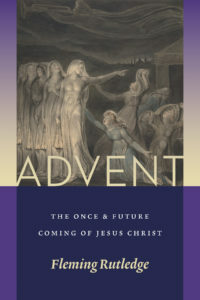 Advent: The Once and Future Coming of Jesus Christ Fleming Rutledge (Eerdmans) $30.00 This is without a doubt the most talked about book about Advent in our memory, and for good reason. This sturdy 400+ page paperback volume is laden with Mrs. Rutledge’s legendary, richly theological, provocative (but always orthodox), meaty but persuasive sermons. There are some essays here, some Bible studies, other writings and sermons galore, for every special day of the season (and then some. As a serious Episcopalian, she’s included some special days I’ve never even heard of!) A few of the sermons are recent, some older, typed up from her old manuscripts — a labor of love! Those of us who have heard the Reverend Rutledge preach know how good she is. Those of us who have heard her lecture or met her in person know how gracious and interesting she is. Those who have read her books – from the extraordinary The Crucifixion: Understanding the Death of Jesus Christ to her excellent collections of sermons (one on preaching the Old Testament, one of sermons on Romans, one that is a general collection, one a study of Tolkien, one on the last words of Christ) – all know how wise and interesting and informative and valuable they are. As we noted when we first announced this new book earlier this fall, there are just pages of endorsing blurbs, good quotes from across the theological spectrum, but mostly from those I trust the most. From Michael Gorman and Richard Hays to Wesley Hill and James K.A. Smith, there are so many who insist this book is well worth having. Allow me this bluntness: if you care about the theological tenor of our churches, if you like serious theological books at all, if you care about the holiday’s integrity and wish for something more than sentiment this season, you should buy this book. 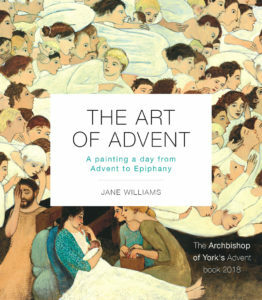 The Art of Advent: A Painting a Day from Advent to Epiphany Jane Williams (SPCK) $15.00 My, my, this may be our favorite Advent book this year! We had many customers who loved her publisher’s similar The Art of Lent which we heartily recommended last Spring. This one, like that one, is a square-sized, small paperback, about 150 pages, making it a truly delightful gem to carry in a purse or backpack or to give as a simple gift. But, yet, it is rich, with full-color artwork for each day of Advent. The art is reproduced nicely, the paper is glossy but still lighter weight. It is such a great little volume to hold and glance through. Importantly, though, these are rich, insightful meditations, nicely written, Biblically-based, each using a painting or artwork as a springboard to reflect on living well and out of Advent hope. Ms. Williams has written several other thoughtful books and is Assistant Dean and Lecturer in Systematic Theology at St. Mellitus College in the UK. The Advent of Art is The Archbishop of York’s Advent book for 2018. By the way, there are plenty of masterpieces shown here. 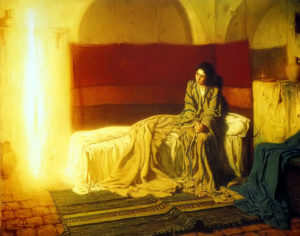 There are those great artworks that you might expect for a holiday book – from da Vinci’s The Virgin and the Child with Saint Anne to medieval classics like Francesca’s odd The Nativity and (thanks be to God) the spectacular Annunciation by Henry Ossawa Tanner. Because Williams is attuned to the themes of the church season, there are pictures and themes that some may find jarring – Herodias Bosch on hell, unexpected pictures on judgment, visual (and written) meditations on Noah and Jeremiah and Christ’s work, including the hope of Apocalypse. (The famous Rembrandt on the Return of the Prodigal Son that Henri Nouwen made is here, as is the haunting William Holman Hunt on Christ as the Light of the World and some others that at first glance don’t seem seasonal, but they are!) Many of the paintings, though, (again, some Advental, some Christmassy, and some seemingly not) are most likely not immediately familiar. There are some contemporary pieces and several by non-Western artists (including Julia Stankova and Meg Roe and the marvelously colorful He Qi.) To see medieval tapestries or ancient icons next to very modern pieces is just so great. The mix of old and new is wonderful. To ponder what this theologian sees in the Biblical text inspired by these paintings is a blessing. 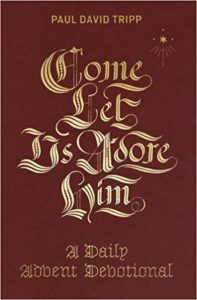 I would like to suggest that you might want to own this book even if you don’t use it as a daily devotional this month. It is an inexpensive way to become familiar with great paintings, to learn about certain artists, and to see how to exegete them with Biblically-trained eyes and a Christian mind. Highly recommended. 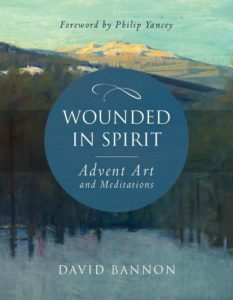 Wounded in Spirit: Advent Art and Meditations David Bannon (Paraclete) $29.99 This glorious full-size hardback book (with a wonderful foreword by Philip Yancey) is the most beautiful devotional book of the season. Each meditation is paired with a moving reproduction of classic art, nicely reproduced on rich, glossy paper. In this mature and artful presentation, it reminds us of the early (now out of print) Paraclete classic God With Us. (That is still available in the “readers edition” that omits the artwork and remains one of our best-sellers in recent years with its literary ruminations and poetry and mature reflections.) Like that one, this is a treasure to behold. Wounded in Spirit stands out not only because of the subtly lavish design but because of its amazing content and spirit. David Bannon writes from profound personal experience, offering ways to commune with God through Scripture. He also tells some poignant stories of artists who lived through great pain. He himself has gone through some very odd stuff, and much grief. His adult daughter died of a drug overdose even as his own professional life was in difficulty. I could review this book in great detail, but I suppose you get the picture – it is very handsome, mature, thoughtfully spiritual and honest about the great brokenness of our lives, of our society, of our times. This book will inspire in the deepest, truest sense of the word as it evokes ways to be honest about our sadness and helps us find God’s comfort (and joy) in this season. That is uses artwork to help us get there is such a blessing as sometimes words just fail. This book is a gift for the hurting, but a gift for any of us who feel what we feel these days. I suppose you know that some churches have “Blue Christmas” services. It makes perfect sense – not only because of the need to help those who are “blue” but because the season itself, liturgically speaking, is a bit somber. Advent is a time of waiting, of longing, of unfulfilled desire, of anticipation for God’s healing. Many Advent devotionals speak about darkness and light. 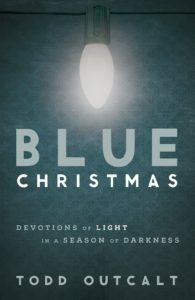 Blue Christmas applies those familiar metaphors to those who really are full of hurt and fear and disappointment. He offers Scripture and prayers, meditations and concrete action steps to walk through the darkness during this time of year. It includes questions for personal reflection (or group discussion) and a worship service plan for congregational use. Pastors – you need to have this on hand to share with those God brings across your path this month. 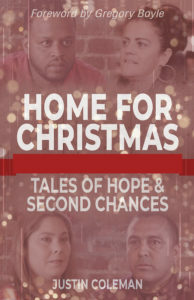 Home for Christmas: Tales of Hope & Second Changes Justine Coleman (Abingdon) $16.99 Wow. This unique book is a very fine, short, stand-alone study with four good chapters – maybe you could use it as a family, or in a small group, but it’s good for individual reading, too. There is also a DVD ($39.99) for a Sunday school class or Adult Education forum (and, of course, a Leader’s Guide ($12.99) for those leading conversations about the DVD curriculum) and a youth edition book ($9.99. )This is really an amazing study and we simply do not know anything else like it. We all have longings for home, desires for a more profound, lasting experience of hope, love, joy, and peace. If you let these formerly incarcerated or gang-affiliated men and women tell their stories, these themes just might come alive in fresh ways for many of us. This is fresh, inspiring, raw, and real, and shows how “the light of Christmas shines brightly even in hard times.” That sounds like a cliché, but in Coleman’s hands, as he opens up the Bible in conversation with these brave men and women of the streets, it is anything but. 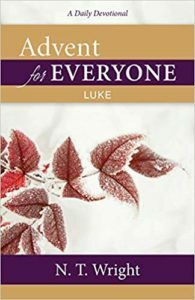 Advent for Everyone: Luke N.T. Wright (WJK) $16.00 Who wouldn’t want to hear what Tom Wright offers as a daily devotional through the Gospel of Luke? The wider church uses Luke in this year’s lectionary (Year C) so this is perfect. (By the way, last year Tom released a similar daily devotional, also called Advent for Everyone, that studied the Epistles. We highly recommend that, too!) Here he shares incisive Bible commentary for each day through the Saturday after the Fourth Sunday in Advent and offers a thought-provoking question for either personal or small group question. You get his original translation of the text, too, as you’d find in his “For Everyone” commentaries. 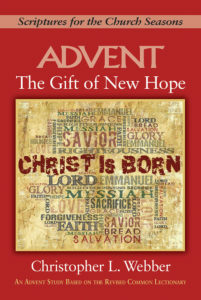 Advent: The Gift of New Hope Christopher L. Webber (Abingdon) $9.99 This is the 2018 edition of the “Scriptures for the Church Seasons” study which is a five-week Advent study based on the Revised Common Lectionary. This is designed for small group use and there are leader helps included in each chapter. It interacts with the given Year C Old Testament, Gospel and Epistle texts. Nothing like it in print. Since the Reverend Keller left the church last year he is busy writing (his new, short book on Jonah is brilliant!) and leading a network of edgy but orthodox church planters wanting to advance the gospel and seek the common good for their cities and locales. 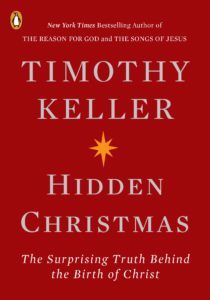 Keller has a way to help us clearly understand and more intellectually explain the core truths of the Christian faith and the vast implications (personally and socially) of focusing on first things first, the gospel work of the servant King who was born as a babe. For any who wonder about the historicity of these first century accounts or the spiritual relevance, give this a try. Given the darkness of our world, a little clarity about truth and a lot about the Light sure is helpful. Very highly recommended. 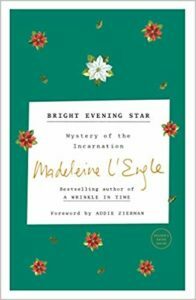 This brand new edition with great cover design that matches the other recent reissues includes a valuable foreword by memoirist Addie Zierman who says Madeleine’s book offers words that “feel like a sharp inhale of hope to me now” and a new reader’s guide.